Hundreds of Oregon Dive Sites Await! Welcome to our project to catalog all Oregon dive sites that are accessible to SCUBA divers! We are attempting to visit, dive, and review every single dive site that we can find in the Beaver state. This is an active and ongoing project. Please get in touch with us if you know of some dive sites that we haven’t visited yet. Many of these are the absolute best dive sites in Oregon. Some are not much fun but are still something to do on a rainy Saturday. All of the Oregon dive sites we list here are diveable within recreational SCUBA diving limits and all of them are in the state that we love. The northern Oregon coast offers several great areas to go diving. Tillamook Bay’s SCUBA diving sites are plentiful and if one site is blown out due to weather, another site should still be an option. Further north toward Astoria, there are several sites that are more off the beaten path. All of these SCUBA diving sites are great salt water Oregon dive sites. If you know of any other sites that we should try, please let us know! Fort Stevens – South Jetty at the Mouth of the Columbia River: Weather has to be absolutely perfect to dive the south jetty of the Columbia River but there is easy access if you have a 4×4 truck and an OHV sticker. Hammond Boat Basin – North Jetty: The current can be ripping here but this dive site is fun to explore. Hammond Boat Basin – South Jetty: This is a good place to go crabbing or spearfishing. Barview – Inner North Jetty at Barview Jetty County Park: A difficult walk to the jetty is worth the slog if you want to hunt lingcod or go crabbing. Barview – Middle North Jetty at Barview Jetty County Park: This site has a decent entrance with a small parking area. Visibility is usually a little better here than the inner north jetty. Barview – Outer North Jetty at Barview Jetty County Park: This site has an easier entrance than the dive site closer to US101 but is more exposed to ocean conditions. Barview – South Jetty on Tillamook Bay: Only accessible via a boat, a long surface swim across the channel, or a very long walk (unless the road is open the day you visit), this site doesn’t see very many divers but has good crabbing and spear fishing. Barview and Garibaldi – Crab Rocks / The Three Graces: The three rocks that stick out of the water near the highway and railroad tracks are a great place to do some exploring for crabs and play in the confusing currents. Garibaldi – Lumber Dock: This is an easy site to dive in the Tillamook Bay in case the jetties are too rough or if you want a more mellow dive. Garibaldi – Crab Dock: This site is great to dive if the rest of the bay is too rough and if you want a change from the lumber dock. Nehalem – South Jetty: You can dive the jetty like any other jetty in Oregon for good crabbing and spearfishing or you can drift dive up into the bay. The south jetty in Newport where there are six distinct Oregon dive sites. Newport has at least ten dive sites that we know of in Yaquina Bay or just offshore. Immediately around Newport there are a half dozen other SCUBA diving sites giving divers plenty of places to go discover some local diving. The central Oregon coast has many of the most well-known Oregon dive sites. Every Oregon SCUBA diver we meet has heard of some of our favorites in Newport and Florence. There are many others that are less well-known and no less fun to dive. Several fresh water lakes along the central Oregon coast give divers a good backup option if the tide isn’t right and allow divers to rinse the salt off their dive gear. If you know of any other sites that we should try, please let us know! Fogarty Creek Kelp Forest: This kelp forest is a rare shore dive on the Oregon coast that can be accessed in ideal conditions. If the conditions aren’t perfect, have a backup dive site in mind. Government Mound: An offshore site near Boiler Bay. Boiler Bay: Maybe you will discover the old boiler lost from a shipwreck in the bay. Government Point: This spot is along the craggy coast just south of Boiler Bay. Depoe Bay – North Point: A somewhat shore-accessible site right at Depoe Bay that is much easier to dive with a boat. Depoe Bay – Flat Rock: Just outside the smallest harbor in the world. Depoe Bay – Boat Ramp: A shallow dive that can be used to checkout gear before going offshore for more adventurous diving. Depoe Bay – North Reef: A great place to go hunting right outside Depoe Bay. Whale Cove: A ways down from Depoe Bay but it’s an interesting place to go. Newport – Oregon Coast Aquarium – Orford Reef: Unless you volunteer to dive at the aquarium as a tank cleaner, it is very difficult to get permission to dive this tank. You might get the chance to dive this tank if you have sufficient skills though. Newport – Oregon Coast Aquarium – Halibut Flats: The DUI Drysuit Days used to use this tank for many of their drysuit checkout dives along with the medical tank. Now it’s on the list for private aquarium dives. Newport – Oregon Coast Aquarium – Open Ocean: This tank is where most people dive when they book a private SCUBA experience at the aquarium. Newport – South Jetty – First Finger: A shallow dive site with lots of crabs at the right time of year. Newport – South Jetty – Second Finger: This site is a little bit deeper than the first finger and has lots of life on the jetty rocks that stick out into the Yaquina River’s exit to the sea. Newport – South Jetty – Third Finger: Many people dive this site looking for crabs or to hunt perch or lingcod. Newport – South Jetty – Fourth Finger: A shorter dive with a challenging entrance that often has better visibility (by a few feet!) than the fingers closer to the bridge. Newport – South Jetty – Fifth Finger: The shortest of the fingers with a difficult entrance. SCUBA divers are rewarded with great micro life on this finger although the current can be a challenge. 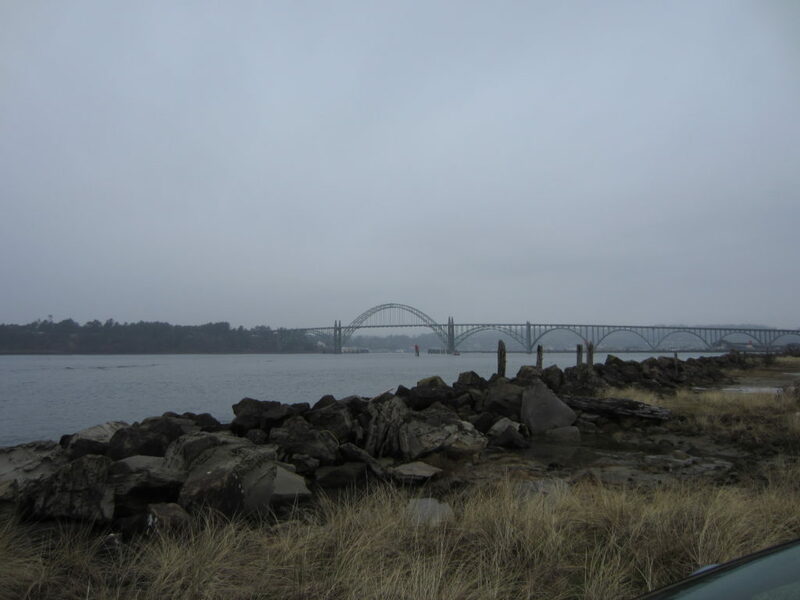 Newport – South Jetty – Jetty Tip: The end of the jetty where the Yaquina River meets the sea has lots of life but is a very challenging dive to do because of surf, tide conditions, and a long surface swim. Newport – OSU Research Dock: You need permission to dive this dock but when the R/V Oceanus, R/V Elakha, or R/V Pacific Storm is in port, this can be a really neat dive. Newport – OSU Research Pyramids: This is really three sites with six underwater cinder block pyramids covered in life connected by their shared research purposes. Maybe you will be the lucky person ot find the missing pyramid! Newport – Public Crab Dock: It’s a good idea to have someone on the surface while you dive under this dock in case amateur crabbers get mad at you for diving around their crab pots. Many lost crab pots and other things lost by tourists can be found under the dock. Newport – South Beach Reef: If you have a boat with a good captain and some calm weather, the south beach reef has amazing life teeming over it from the deepest section at 60+ feet up to the shallows near where the surf normally breaks. Olllala Reservoir: This freshwater lake just outside Newport is a good place to go to finish off a tank of air and clean your gear before heading back inland. Yaquina John Point: This is a good place to crab but should only be attempted at low tide. Florence – North Jetty SCUBA Park and Crab Hole: A great place to get some experience in salt water with an easy entrance and exit, a good place to find crabs, and close parking. Florence – North Jetty End of the Road Parking Lot: If the SCUBA park is full of people, this dive can be quieter. The tide can be a bit of a challenge though. Florence – South Jetty Inner Fingers: Four fingers with deeper holes at their tips make for some interesting boat dives in search of crabs. Florence- South Jetty Crab Dock: This is a great place to go diving when other salt water sites in Florence are too rough. It also has really easy entrances and exits. Florence – South Jetty Middle Area: This is a good place to do a long drift dive and hunt some crabs. Florence – Woahink Lake West Boat Ramp and Bridge: Local dive shops have put a bunch of stuff underwater here for divers to explore. Look for the KISS concert. Florence – Woahink Lake East Boat Ramp: A good place to go do checkout dives with new equipment, clean the salt off of your gear in fresh water, or do training dives. Florence – Woahink Lake Sunken Train: An old train fell into the lake long ago. Now you can go dive it and explore the past. Umpqua River South Jetty and Triangle Jetty: Inside the triangle jetty is a safe bet any time of the day or night and in almost any sea condition. It’s protected all the way around and isn’t even really impacted by tides. On the outside of the triangle jetty and along the Umpqua River south jetty, it can be a different story. Winchester Bay – Eel Lake: There is wreckage underwater to explore. Winchester Bay – Hall Lake: A shallower fresh water lake that is good for training dives. The harbor at Port Orford has several excellent Oregon dive sites on the southern Oregon Coast. Some are only accessible by boat but some can be reached by SCUBA divers entering from the shore. The southern Oregon coast is almost completely unknown to many of the SCUBA divers that we know in the Portland metro area. The dives are often more challenging and more weather dependent than dive sites further up the coast, but they are no less rewarding. If you’re looking for Oregon dive sites on the southern Oregon coast, you will be richly rewarded. If you know of any other sites that we should try, please let us know! North Jetty: There are a lot of opportunities here to try out different types of diving. The site is somewhat difficult to access so there are fewer divers here than elsewhere in Coos Bay. Fossil Point Sunken Jetty: There’s a submerged jetty just offshore from Fossil Point that is a decent place to hunt for crabs. Sunset Bay: This is a great little beach-access surf-entrance dive site that is often diveable even when the ocean is rough. South Jetty: The south jetty has some good crabbing and spearfishing although conditions can be rough. Bullards Beach State Park Boat Ramp: This is a good backup plan if the jetties are too rough and the Bandon waterfront is too busy. Rocky Point Boat Ramp: This is a backup plan to the backup plan of Bullards Beach boat ramp. There isn’t much reason to dive here other than if you really want to dive when conditions are lousy elsewhere. Riverton County Park Boat Ramp: This is a river dive upstream from Bandon. You won’t see much other than some mud and rocks but it’s diveable. Fox Rock: We think this rock rising out of the sea holds the record for the farthest west you can do a recreational dive in the state of Oregon. Port Orford Jetty and Graveyard Point: A shore-accessible dive site in the heart of Port Orford with a number of entrance and exit options. 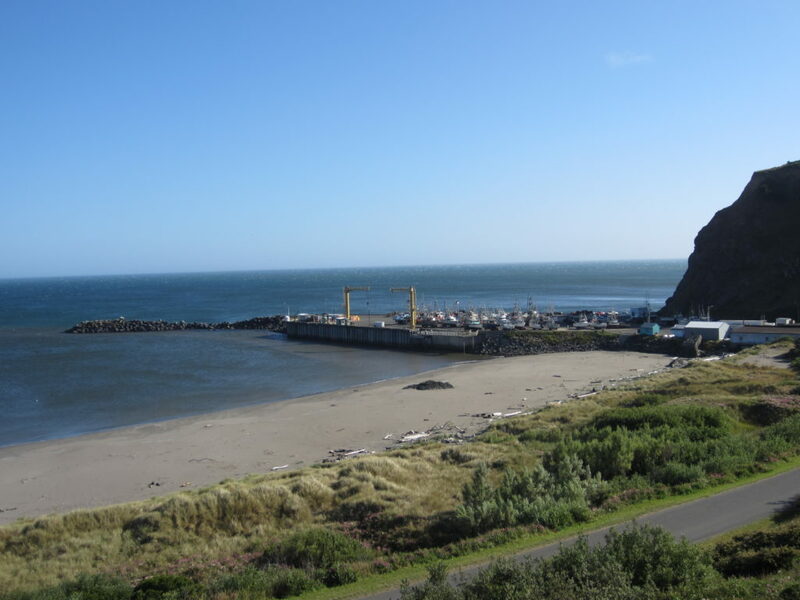 Gold Beach North Jetty: This is a good place to go hunting for crab or do some spearfishing although the dive site is pretty shallow. Zwag Island and Diver Rock / Mill Beach: This is a fun surf entry dive site with a small kelp forest to explore. We’ve seen people spearfishing here. Many people never think to SCUBA dive in the northern Cascades but there are several alpine lakes that are worth a look. The close proximity to Portland makes these Oregon dive sites a good option for SCUBA divers in the metro area and Willamette Valley who want to go for a dive but don’t want to go to the coast. If you know of any other sites that we should try, please let us know! Clear Lake: No, this is not the Clear Lake outside of Eugene. This is the Clear Lake near Mount Hood. Clackamas River – North Fork Reservoir: There are several dive sites along this reservoir and depending on river conditions, there may be some drift diving. 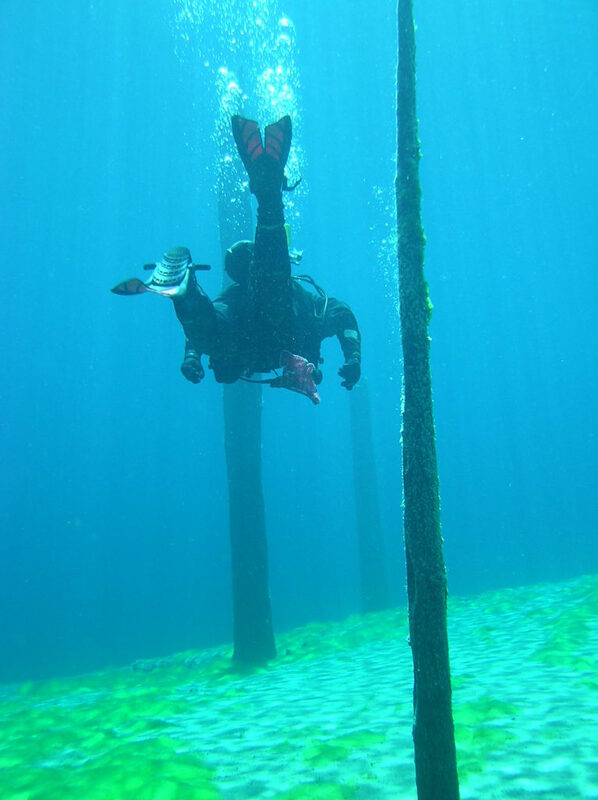 Deep, clear water awaits SCUBA divers at Clear Lake! A whole underwater forest is down there, just waiting to be explored. There are several Oregon dive sites here. The central Cascades have some excellent Oregon dive sites that sometimes makes international SCUBA diving magazines. Clear Lake in particular is an incredible place to go diving. While these are altitude dives, the training required to do the dives is worth your while to experience the crystal clear blue waters of the central Cascades. If you know of any other sites that we should try, please let us know! Clear Lake – Pool North of Lodge Boat Ramp: A quintessential Oregon dive site with an amazing sunken forest and deep, inviting submerged springs. Clear Lake – Main Pool Sunken Forest: A huge old growth forest is hidden under the tranquil blue waters. Trail Bridge Reservoir – Submerged River: The old McKenzie River’s bed makes for a great drift dive. Trail Bridge Reservoir – Day Use Area Sunken Creek: The old creek that comes down from Smith Reservoir is a good place to do training dives or practice your buoyancy skills. Trail Bridge Reservoir – Campground Bay: The campground is a great place to stay for a few days while you dive up and down the McKenzie River. You can play in the grass and algae beds of the bay while you look for golf balls and soda cans. Smith Reservoir – Upper Car Turnaround: Access the middle part of the reservoir where it is a little less deep. Smith Reservoir – Dam Boat Ramp: If you want to go deep in the Cascades, you can do it here. Carmen Reservoir – Ice Cap Creek Day Use Area: This is a good place to practice using your altitude tables for altitude diving. The creek coming into the lake provides a fun place to play in the current and try out some drift diving. Carmen Reservoir – East Boat Ramp: This quiet bay has very easy access and is a great place to practice skills for divers with only a few dives under their weight belts. Foster Reservoir – Calkins Park: When the lake is full enough, the area around the boat ramp in Calkins Park is a good place to go do some training dives or look for things that fell off of people’s boats. Foster Reservoir – Shea Viewpoint: The entrance on this dive site can be a little challenging when the water is low in the reservoir. The main attraction here is how deep you can go in the lake. Trout like to hang out in the boulder field. There are several other Oregon dive sites around Foster Reservoir that are boat-accessible. Big Cliff Reservoir – Upper River Bottom: The old Santiam river channel submerged under Big Cliff Reservoir is an exciting and challenging high speed drift dive. Big Cliff Reservoir – Old Boat Ramp by the Transmission Tower: This gives good access to huge potholes in the submerged riverbed of the Santiam river. The dive is challenging for even experienced divers but is well worth the reward. Detroit Lake – Old Detroit Town Site: Sometimes referred to as “Coe,” the original town site of Detroit has a bunch of concrete foundations which are diveable when the lake level is right. Jawbone Flats – Opal Pool: The pool below the waterfalls on the Little North Santiam is an interesting place to go diving if you are willing to carry in your gear a few miles on foot or in a wagon. Big Lake: This alpine lake doesn’t seem to drain to anywhere but is most easily accessed from the highway that runs up the Santiam River. Waldo Lake – Shadow Bay Day Use Area Boat Ramp: With no motorized vessels alowed on the lake and plenty of clean snow keeping the water level high, the lake has great visibility (100+ feet). Fall Creek – Big Pool: This fun little dive in a deep hole on Fall Creek not far from Eugene. The last time we went diving at this site, we found several broken glass pipes and a few other interesting pieces of Eugene culture. Crescent Lake: This alpine lake is accessible to anyone with open water SCUBA certification and altitude diver training. Summit Lake: A national forest road leads to this lake at the crest of the Cascades. The southern Cascades and Siskiyous are uncharted territory for many people from the northern part of Oregon but southern Oregonians and northern Californians know about all of the great Oregon dive sites to check out on SCUBA in the mountains. If you know of any other sites that we should try, please let us know! Applegate Lake – Copper Boat Ramp: This site is good for divers who want a reservoir in southern Oregon for some diving adventures. Several other Oregon dive sites are in the immediate vicinity. Emigrant Lake – Klamath Junction: An old town submerged beneath the reservoir. Lake Ewauna: There are several spots on this reservoir just south of Klamath Falls where you can go diving. Upper Klamath Lake: There are a number of spots you can hop into the water here. There are a few scattered dive sites in northwestern Oregon that are worth a peak. A river here, a reservoir there, and a few old quarry ponds are available to the intrepid diver looking for something different close to Portland. Prescott to Coffin Rock: The old Trojan Nuclear Power Plant once drew its cooling water from the Columbia River here. Cascade Locks: The old flooded locks make for some interesting diving along the river. The Willamette Valley has a few dive sites that people sometimes visit. Most of the rivers are too laden with silt to make diving them worthwhile but the occasional quarry pond or small lake can offer opportunities to hunt for crayfish or look for old sunken machinery. If you know of any other Oregon dive sites in the Willamette Valley that we should try, please let us know! Jenna’s Pond: An old rock quarry pond next to an active quarry has delicious and abundant crayfish. Talk with the property owner to arrange permission and have locked gates open before you try to dive this site. As SCUBA divers from Bend will tell you, Central Oregon has many great Oregon dive sites. Depending on the time of year, visibility can be absolutely stunning in some of the lakes and reservoirs in the area. Abundant trout, salmon, and crayfish make for interesting underwater wildlife observations. If you know of any other sites that we should try, please let us know! Lake Billy Chinook – The Cove Palisades State Park – Crooked River Boat Ramp: There is a little diving around the boat ramp where you can look for things that boaters have lost overboard. If you have a boat, the submerged cliffs along the banks are quite interesting to dive. Lake Billy Chinook – The Cove Palisades State Park – Lower Deschutes Boat Launch: The boat launch and surrounding areas have some interesting underwater rock formations. The water clarity is usually very good. Lake Billy Chinook – The Cove Palisades State Park – Upper Deschutes Boat Launch: A good site for a long wall dive in central Oregon that’s worth the drive. Odell Lake: We always thought that the game Odell Lake was based on this place as kids but now we know it as a pretty decent Cascades dive site. East Lake: Among several site choices is the hot springs beach area. Eastern Oregon is full of fresh water Oregon dive sites that most Oregonians would never even realize are diveable. From the Snake River dams where a sunken town can be dived to alpine lakes carved by glaciers, eastern Oregon has many great SCUBA opportunities. If you know of any sites that we should try, please let us know! Brownlee-Oxbow Highway North Pull-Out: This is a convenient place to dive on the Snake River behind the Oxbow Dam although current can be an issue. Brownlee-Oxbow Highway North Boat Ramp: The farthest north boat ramp on the Oregon side of the Oxbow Reservoir. Robinette Townsite: Under the Brownlee Reservoir, this little town was flooded out when the dam was built. Some foundations remain underwater. Harry M. Hewitt Memorial Park Boat Ramp: On the Snake River, this boat ramp is diveable. There are some lakes and reservoirs in north central Oregon that we think are diveable. We haven’t gone to explore them yet but if you have, please get in touch! Celilo Falls: Flooded by the Dalles Dam in 1957, we’re pretty sure the falls are reachable on SCUBA. Celilo Canal: It was flooded when the Dalles Dam was built but it’s still down there. We didn’t believe we’d ever go diving in Southeast Oregon but there are reservoirs and lakes to dive! The novelty of Oregon dive sites in a desert far away from the major population centers of the Beaver State makes it worthwhile to haul your gear out to Oregon’s Outback. If you know of any sites that we should try, please let us know! Antelope Reservoir: Just down the road from Jean Baptiste Charbonneau’s grave (the infant that Sacagawea carried on her back across the American west with the Lewis and Clark Expedition) on the far eastern edge of Oregon, this reservoir is worth a dive for the novelty of the location. Upper Cow Lake: The larger of the cow lakes has an old lava field that plunges into the western edge of the lake. Lower Cow Lake: Access is somewhat more challenging at Lower Cow Lake but using a boat to go access the lava field is an interesting activity. Bully Creek Reservoir: Water gets pretty stagnant here so it’s a good idea only to try out this dive site when there are spring rains or a big snow melt to pump fresh water into the reservoir. Skull Creek Reservoir: This is the farthest south and east permanent body of water that we know of in Oregon that is technically diveable. This is Roaring Springs Ranch property so make sure you have permission well in advance before you come out to southeast Oregon. Willow Valley Reservoir: It’s gross in the water unless there has been a lot of rain recently but you’re just north of the California state line. Borax Lake Hotsprings: It’s shallow, the water is filled with minerals, and the dust is alkali and biting but this is a hot springs that you can do a dive in out in the middle of nowhere. It is worth the reminder that conditions at Oregon dive sites can change rapidly. Many of the Oregon dive sites we list here can only be dived in good weather. Ocean conditions often mean that the more exposed Oregon dive sites along the coast (and especially those that are offshore) are not diveable. A large number of the Oregon dive sites that can be found at reservoirs across the Beaver state are too shallow and with too poor of water quality any time other than in the spring or early summer. Oregon dive sites in rivers can be treacherous when runoff makes the rivers swift and cold. You must dive within your personal limits. Please review our legal and disclaimer page for more information.